After a morning of downpours, the sun broke out briefly this afternoon and drew me outdoors. 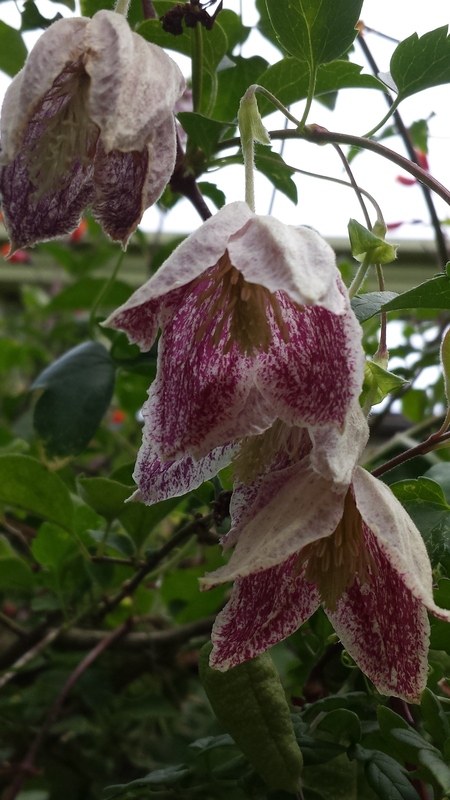 My fabulous winter bloomer, Clematis cirrhosa ‘Freckles’, was putting on a glorious show (see photos below). 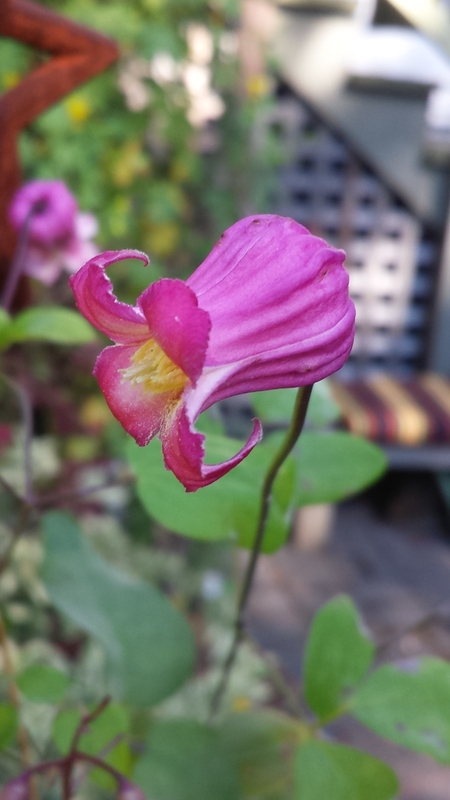 It is such a reliable winter-time bloomer for me. 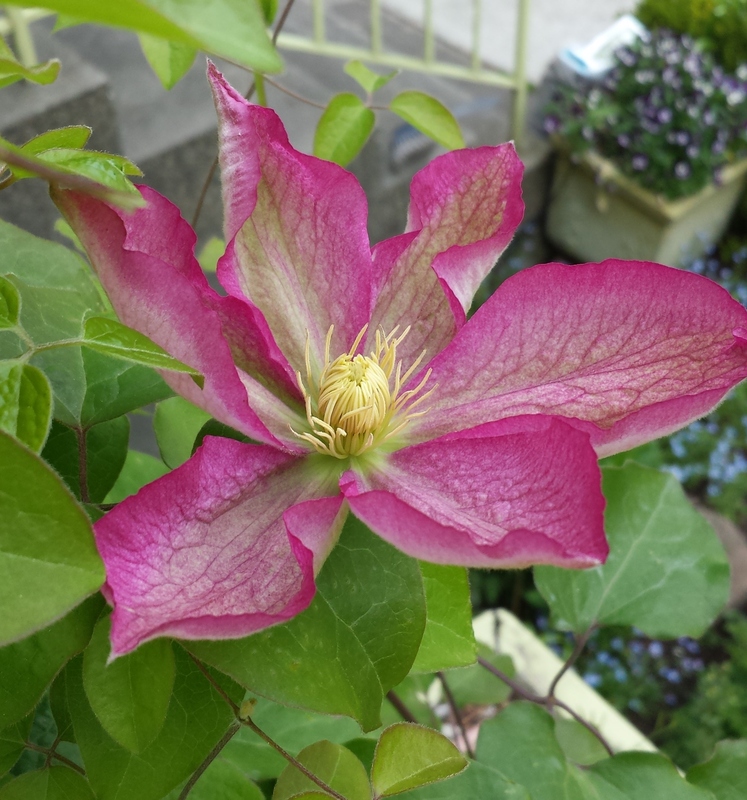 Much to my surprise, several of my spring and summer blooming clematis already have fresh green growth (more photos below)! Fresh new beginnings mingling with the old. Oh, such promise! 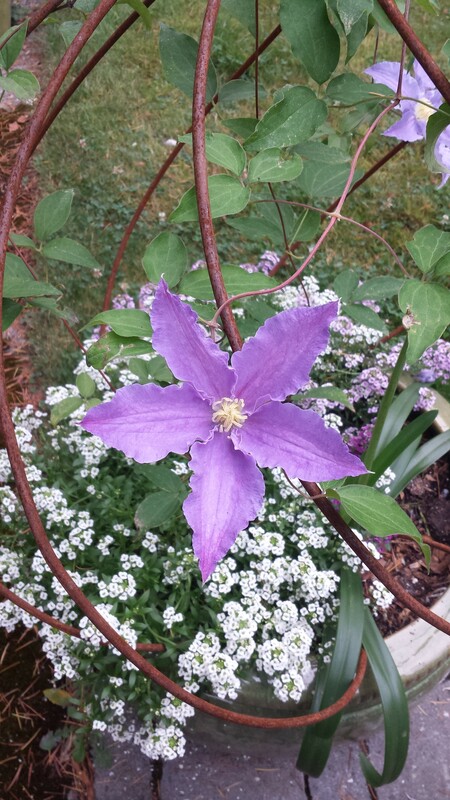 April Clematis of the Month — And More! 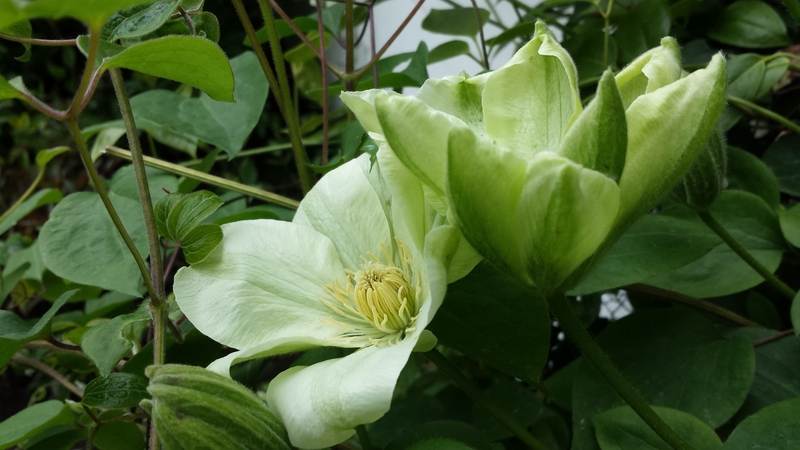 Clematis Guernsey Cream Wins April Clematis of the Month in My Garden! 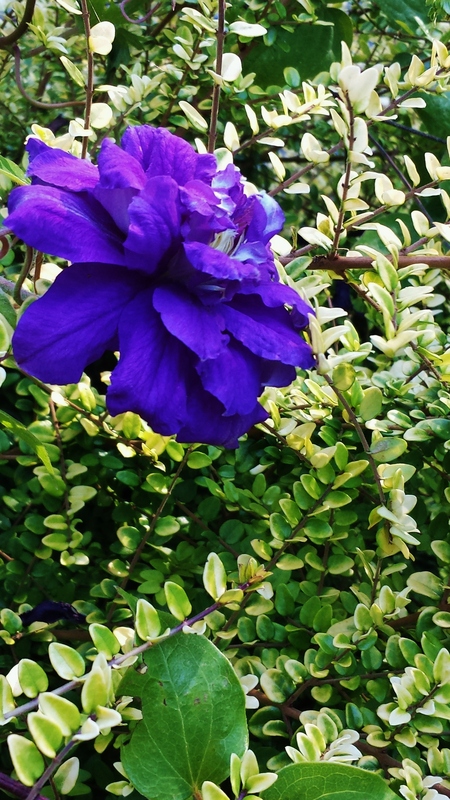 Choosing just one Clematis of the Month for April was NOT easy. 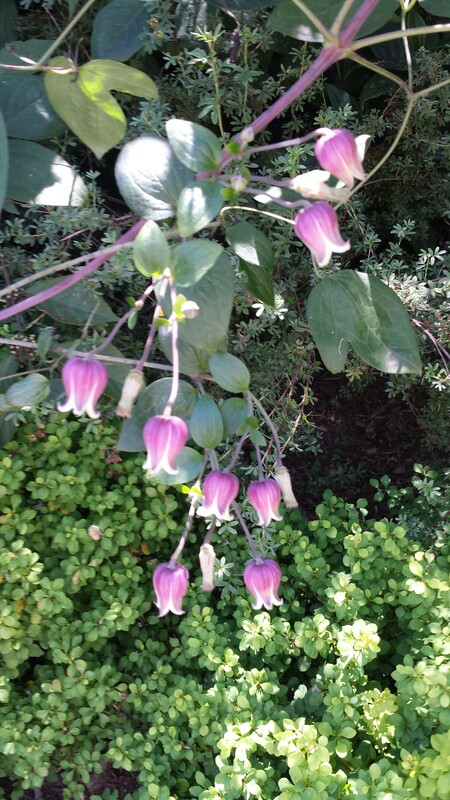 Afterall, my Clematis alpinas were all blooming in April — with Clematis Pauline being my favorite this year. Then, too, Clematis montana Vera was (and still is) looking great — but, being up so high in the cedar, it’s hard to photograph without a telephoto lens. 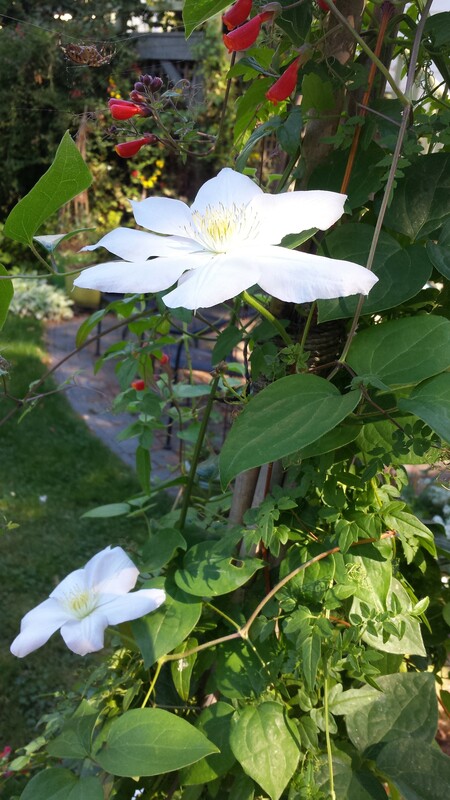 Clematis Guernsey Cream, though, was absolutely stunning in April and blooming early, too! 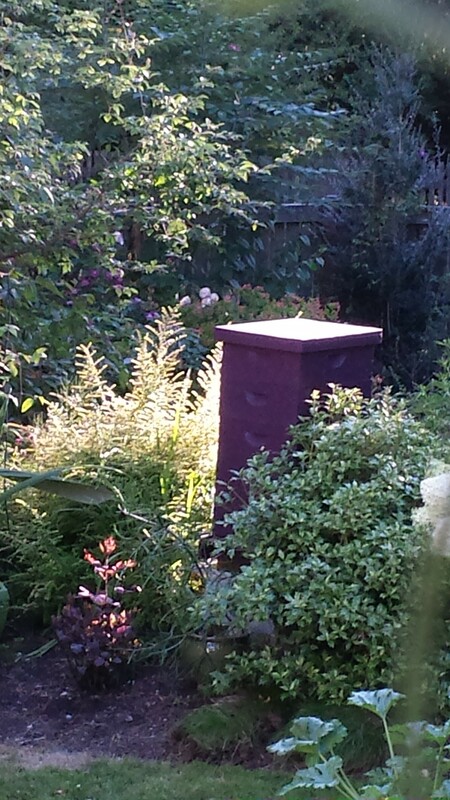 Originally, I thought either C. Josephine or C. Fair Rosamond, with their big juicy buds, would be the next to bloom. 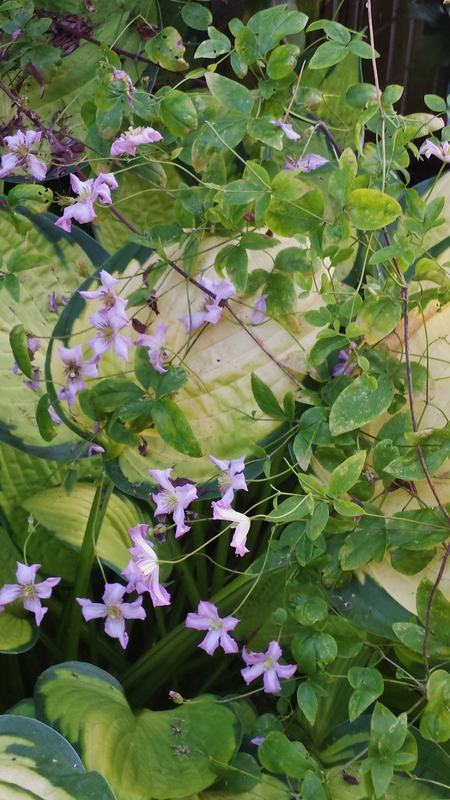 But two lovely C. Asao, one growing in each of my two big window boxes, had a different idea! 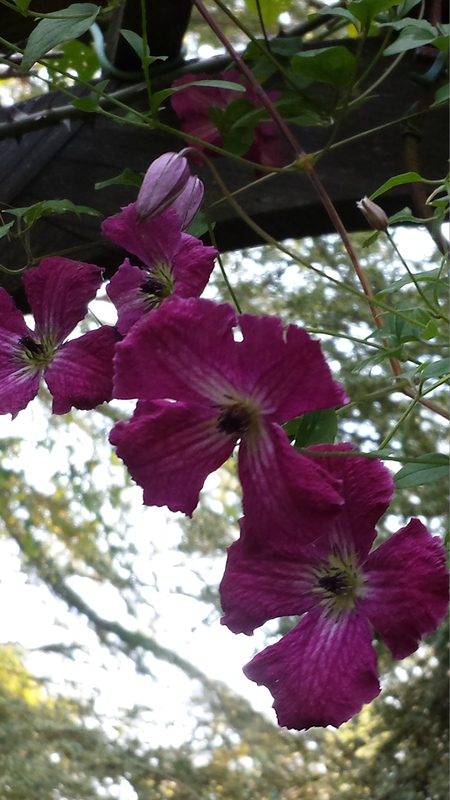 Because C. Asao is a Pruning Group B clematis, I never used to prune them until spring and then only lightly. However, their ugly reddish brown leaves were a blight to my eyes all winter. 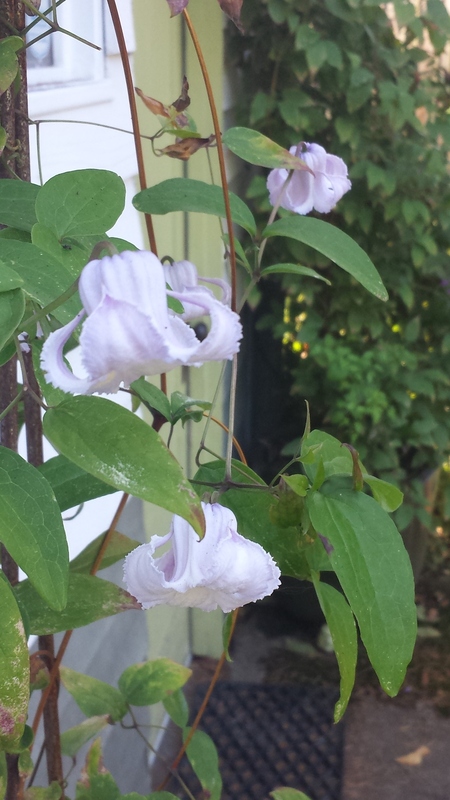 Two years ago I decided to remove both of them and plant Pruning Group C clematis instead because I could cut them back hard in the fall. I happily purchased and planted C. Pariesianne and C. Justa as replacements. But the contrary C. Asao had other plans. They grew back! 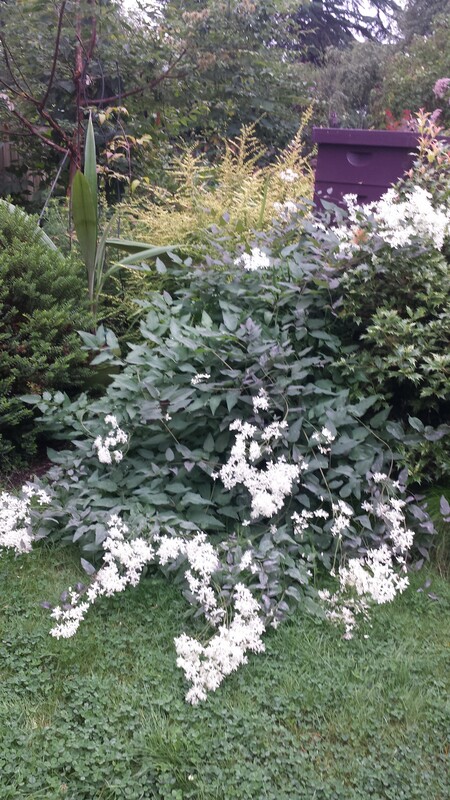 They did not mind hard pruning, blooming in spring anyway! And I think my replacements are being crowded out! Dang. 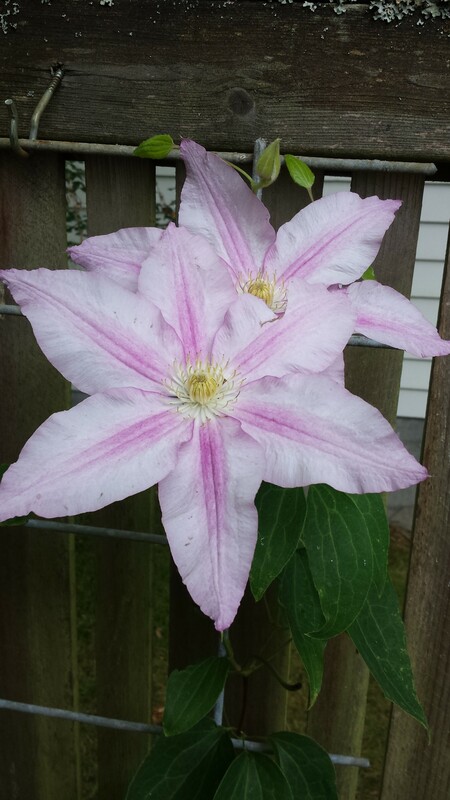 But it is a pretty clematis. Big juicy bud on C. Josephine! Now I really really think that C. Josephine will bloom next! 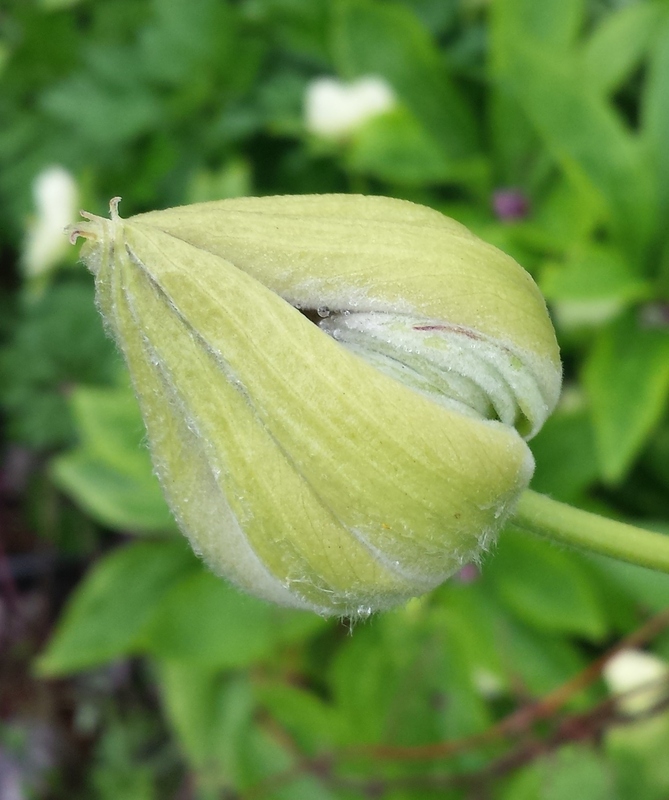 Check out this bud — it may even open tomorrow! 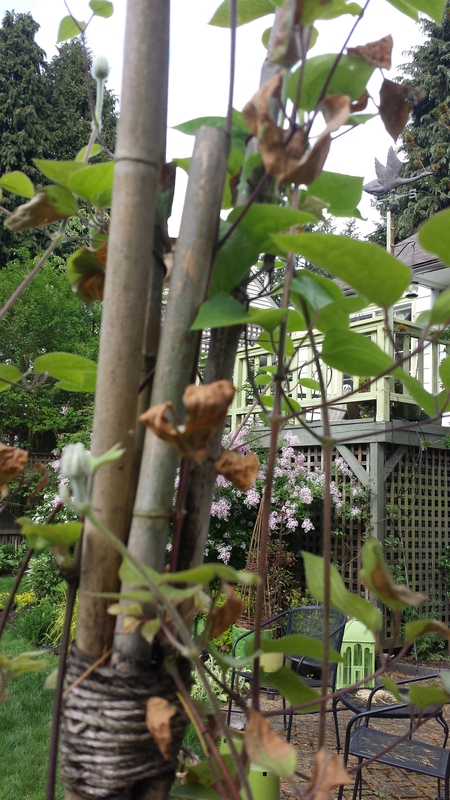 Also, when I was poking around checking on my clematis this afternoon, I noticed that C. Etiole Violette, a great clematis with its dark purple blooms, is also already in bud even though it’s generally a July/August bloomer. Well, maybe June/August. Here in Seattle we have had an exceptionally cool and rainy spring with just a few sunny days mixed in. But last week we were rudely blasted with a three-day heat wave. I know many people enjoyed spring weather in the 80s but some of my plants (and I!) were not thrilled — we would have preferred our sunshine with temps in the 60s or 70s. 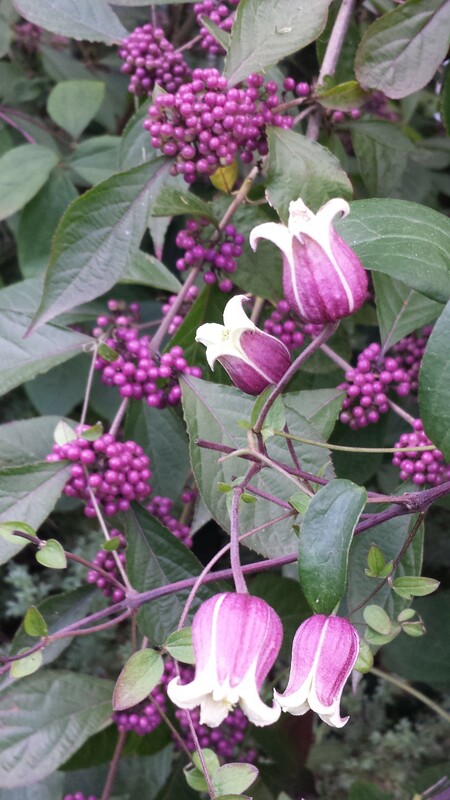 At least two of my clematis, C. Duchess of Edinburgh and C. Margot Koster, ended up with scalded leaves. Guess I’ll just get out my little scissors and cut off the offending leaves.